The human mind has proven uniquely capable of unraveling untold mysteries, and yet, the mind is fundamentally challenged when it turns back on itself to ask what it itself is. How do we conceive of mind in this postmodern world; how can we use philosophical anthropology to understand mind and its functions? While philosophers and social scientists have made important contributions to our understanding of mind, existing theories are insufficient for penetrating the complexities of mind in the twenty-first century. 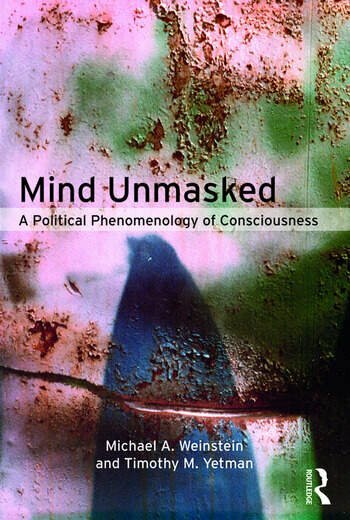 Mind Unmasked: A Political Phenomenology of Consciousness draws on twentieth-century philosophies of consciousness to explain the phenomenon of mind in the broadest sense of the word. Michael A. Weinstein and Timothy M. Yetman develop a thought provoking discourse that moves beyond the nature of the human experience of mind at both the individual and interpersonal levels and present a meditation on life in the contemporary world of global mass-mediated human culture. 4. Welcome to the Fragmentorium! It’s Ridiculous! Michael A. Weinstein was Professor of Political Science at Purdue University from 1968 until mid-September 2015. Weinstein’s philosophical work addresses a variety of areas including existentialism, American classical philosophy, vitalism, twentieth-century Mexican, Canadian and Spanish philosophy, social philosophy, postmodernism, virtue, and technology, among others. He was the author of 22 books and more than 120 journal articles and book chapters in Political Theory, Philosophy, and Sociology. Weinstein also extensively wrote international political analyses for a number of online publications, and became widely recognized as a foremost academic authority on Somalia. Timothy M. Yetman is Adjunct Instructor in Philosophy at Ivy Tech Community College. He has taught courses in research methods, Introduction to Ethics, Introduction to Philosophy, and stepped in during the fall of 2015 to teach his late co-author’s classes at Purdue University in Current Political Ideologies and Introduction to Political Science. His interests range from continental philosophy to postmodernism and media studies.